It is the one day of the year that even your closest friends can use as an excuse to pull a prank on you. The day that you best not forget. It is the day you must wake up ready to keep your eyes peeled for any slight odd behavior. Survive the day without being tricked or fooled and you are a victor; fall to a prank and live up to the laughter for a lifetime. Not everyone can get away with not being fooled on April Fools’ Day. This year, whether you were a victim or not, jokes flooded the internet as they usually do on the first day of the fourth month. 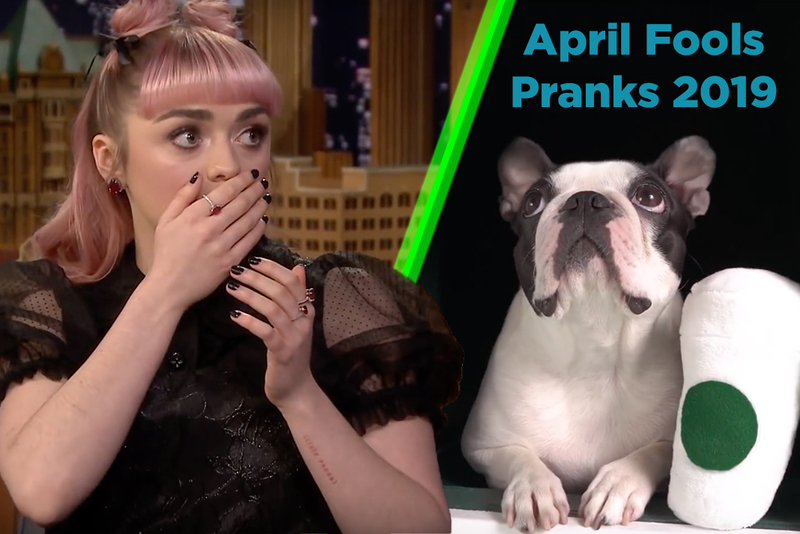 Here are five of the top pranks of April Fools’ Day 2019. With nearly eleven million views on YouTube today, Jimmy Fallon, along with the help of Maisie Williams, shocked internet and television viewers with a prank that was very believable. Williams was brought on the show to discuss the new and final season of Game of Thrones. While under pressure from Fallon begging for deeper information about the upcoming season, Williams gives in. Williams shares a little bit more, trying not to say too much until she accidentally announces the death of Arya in episode two. To the realization of what she just said, she is taken by shock and panics about the information being revealed. Not settling with Fallon that the clip can be edited out, she walks off set. Fallon follows after her and she pops back out from the curtain exclaiming “April Fools!” in unison with Fallon. #2 – Billie Eilish Surprised by Justin Bieber? Ellen Degeneres has Billie Eilish on the show for the release of Eilish’s debut album. One conversation they have is about Justin Bieber, who Eilish hopes to meet someday. Degeneres leads up to acting like Bieber is there, but she admits that he is not. Degeneres comforts Eilish, telling her that she will meet Bieber someday, although there is tension, implying that something is going on. Next thing you know, one of Degeneres’ workers jumps out from the table beside them, scaring Eilish and the audience along with her. However, Degeneres got karma from this prank as she walked into an unknown pool of water from Eilish’s performance. Although it is typical for Degeneres to get a scare out of her guests and this wasn’t exactly an April Fools’ prank, the episode did premiere on the first of April. On the Monday of April Fools’ Day, Good Mythical Morning uploaded their typical daily episode, although the episode was nothing typical at all. Viewers sat down to an awkward episode of Rhett McLaughlin and Link Neal taste-testing different invisible foods. After sitting through the consuming of an invisible burrito and invisible popcorn, it would soon come to the awareness of viewers that this was a joke. The team even went to the efforts of adding sound effects to make the video more entertaining. It did not stop there. The two played an invisible recognization game in their bonus episode on Good Mythical More. Starbucks also got in on the fun this past April Fools’ Day. Knowing the love people have for their dogs, they announced their new concept store: Pupbucks. Dogs can now get in on a similar Starbucks experience just like their owners. Sadly for the dogs (and humans), this was just another April Fools joke. What do you want on a hot day? Something nice and cold of course. Dippin’ Dots is a nice treat to have on a day like such, but they can only go so far when it comes to keeping you cool. Introducing the Dippin’ Dots Deodorant! Created by the same company that brought you the dots of ice cream, now you can stay cool in more areas than just your mouth. With three flavors to choose from – bubblegum, strawberry, and cotton candy – you will be keeping cool and smelling great in the hot conditions. Whether you were the target or the prankster, most of us can look back and laugh at the pranks that occurred. We have all ultimately survived another year of April Fools and have 365 days to take ease from the huge blast of foolery.